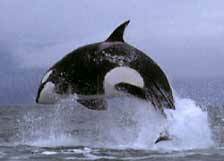 Southern British Columbia is one of the premier areas in the world for Whale Watching. For a large part of the year this applies to the Killer Whale, but tour companies only operate during the late spring to early fall time period. Vancouver Aquarium was the first facility to have these in captivity, but with the departure of its last Killer Whale to San Diego's Sea World in Spring 2001 (where it died shortly after), it was also the first to decide against maintaining the practice. It did serve, however to raise the publics consciousness to the plight of the species and change public perceptions about their name. The facility was never big on using the animals in the sideshow type fashion, so popular in the States. They concentrated mainly on research, and demonstrating the animals natural behaviour to the public. Unlike nearly all other facilities, they were not used in some sort of Aquatic Rodeo. In late winter/early spring, it is also possible to view the migration of grey whales down the West Coast of Vancouver Island. To Whale watch, most visitors tend to go to Vancouver Island. Many operators are based out of Victoria. There is a considerable amount of regulation being placed on this activity. Its popularity is disturbing the natural activity of the whales and the government is trying to find a way to accommodate this growing tourist industry with the needs of the animals. It is now possible to take a Whale Watching tour from Vancouver. 2 Companies offer this. 1) Vancouver Whale Watch operates out of the historic fishing village of Steveston, located at the SW corner of Richmond. The address is #210-12240 2nd Ave, Steveston, BC V7E 3L8. They also have a kiosk on fisherman's wharf in Steveston. Their phone number is 604-274-9565. You can also book a day trip to Steveston including Whale Watching with pickup at downtown hotels by calling 1-877-473-7669 (May-Oct). See the web site link in the table below. They guarantee you will see whales or the next trip is free. This may not help if you have a fixed schedule, but their site claims a high success rate, and I guess if it it didn't, they would lose a lot a money making that guarantee. They also do nature tours around the Fraser River Estuary. In any event the town of Steveston is well worth a visit in and of itself. Plan on spending some time there. 2) Seabreeze Adventures also operate out of Steveston. See the link in the table below. In any event the town of Steveston is well worth a visit in and of itself. Plan on spending some time there. Sea Breeze Adventures - Whale watching out of Steveston, a Vancouver suburb. Vancouver Whale Watch - Whale watching out of Steveston, a Vancouver suburb. B.C. has the world's largest concentration of Bald Eagles. Sorry America, we have kidnapped your national symbol. They can often be seen around Vancouver, especially in The White Rock Area or around Burns Bog off Highway 91. The best place to view them is at Brackendale, near Squamish on the road to Whistler. There is a large reserve there, easily accessible from the Hwy 99, the road to Whistler. During late fall & winter (Late October through February) they gather in the thousands to feed on Salmon in the local rivers. They can also be seen in the Mission are of the Fraser Valley. Check out this link: Eagles. That site contains a map of how to get to the viewing sites near Brackendale. Also in the Whistler area Elaho Adventures offers tours to see them.